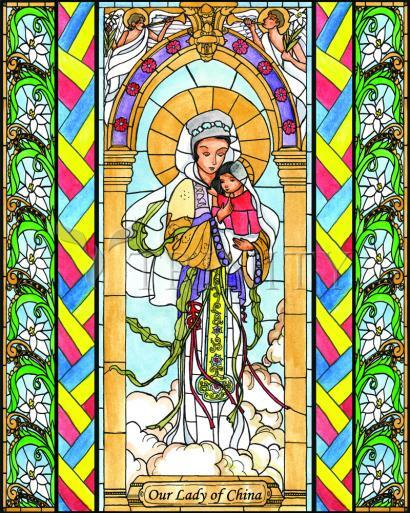 Our Lady gives strength and encouragement to the persecuted Catholics of China under the title Our Lady of China. Early in the 20th century, during the Boxer Rebellion, soldiers attacked the village of Donglu, which was a small community of Chinese Christians founded by the Vincentian Fathers. The frightened people prayed for help and the Blessed Mother appeared with a fiery horseman believed to be Saint Michael, who chased the soldiers away. Donglu then became a place of pilgrimage where people go to pray to Mary as Queen of China with faith that she is watching over them as they struggle to practice their all but forbidden faith under Communist rule. In union with our brothers and sisters in faith in China, Our Lady of China can be found in mosaics and paintings all over the world including the National Shrine in Washington DC. They remind us to keep the Chinese Catholics in our prayers, asking Mary to continue to watch over, protect and guide them and us. Our Lady of China is the name given to an apparition of the Blessed Virgin Mary in Donglu, China, first appearing in 1900. The mother of Christ appeared in China showing herself as the protector and defender for helpless and the righteous. The significance of this apparition is just being realized now… as China begins to take center stage in the Global World and Economy. Mary hopes for a China that could become a shiny beacon of light, a nation where the family is valued, where all Life is protected and the Chinese people have the right to freely worship the great God Almighty. China could become the hope of the world. On the other hand, If China went down a different path – one of darkness and persecution – then God himself would send his army to protect his beloved children. An officially-sanctioned image of Our Lady of China was blessed, granted and promulgated by Pope Pius XI in 1928, in response to the requests made by the 1924 Shanghai Synod of Bishops in China, the first national conference of bishops in the country. Following the event, Archbishop Celso Costantini, Apostolic Delegate in China, along with all the bishops of China, declared the Chinese people dedicated to Our Lady of China, using the official image. In 1941, Pope Pius XII designated theolchina feast day as an official feast of the Catholic liturgical calendar. In 1973, following the Second Vatican Council, the Chinese Bishops conference, upon approval from the Holy See, placed the feast day on the vigil (day preceding) of Mother’s Day (the second Sunday of May). Christian devotion to Our Lady of China has been popular in Donglu. Several churches, chapels, and pastoral centers around the world, predominantly those focused on ministry to Chinese-speaking Catholics, have adopted the name, including a mission in Washington, DC. There is a Chapel of Our Lady of China in the National Shrine of the United States in Washington, DC, established and dedicated in 2002 under the Most Rev. Michael J. Bransfield. There has been some controversy because the image used in the Chapel is not the officially approved image of Our Lady of China, but instead a different Chinese image of the Virgin Mary. The Virgin of Sheshan is another, similar apparition which has attained like acclamation and fame among Chinese Christians. Our Lady of China appeared near Peiping. It stands in a village named Tong Lu. A Poor Mission was started there by the Vincentian Fathers. It was a poor place, perhaps the poorest in the whole region, formerly called “the place of beggars.” In 1900, there were some seven hundred Christians gathered about the little hamlet. Suddenly, the famous Boxer rebellion swept China and grew to such proportions, that even small places like Tong Lu could not escape its fury. In April 1900, a force of ten thousand rioters attacked Tong Lu. The soldiers, in senseless rage, started to shoot into the sky. Then suddenly they fled, frightened, and never came back again. According to the legend, a woman in white appeared above the settlement, and the rioters’ bullets were aimed at her. When the apparition did not fade, attackers had not even time to reorganize because a strange horseman put them to flight. The Tong Lu church was completely destroyed recently by the Chinese Communists, but the picture of Our Lady of China remains intact because only a copy of the picture was used in the church. The original was hidden in the wall behind the copy, and this was recovered and found intact. It is now in possession of Chinese priests who carry out their activities in disguise. As recently as May 23, 1995, Mary appeared. Over 30,000 Catholics from the unofficial Church had gathered for Mass at the Donglu Shrine, on the vigil of the Feast of Our Lady – Mary Help of Christians. There were four bishops of the unofficial Church concelebrating the Mass and nearly 100 unofficial priests standing in the open field. Suddenly, during the opening prayer and again during the consecration, the people observed the sun spinning from right to left. Light rays of various shades emanated from the sky. Participants saw Our Lady of China and the Child Jesus in the sky and also the Holy Family, the Heavenly Father, and the Holy Spirit. The phenomenon lasted approximately twenty minutes.